Sell products, print invoices & manage your stock. Fully integrated, faster than ever. Selling products, tracking stock, checking out a client, etc.. 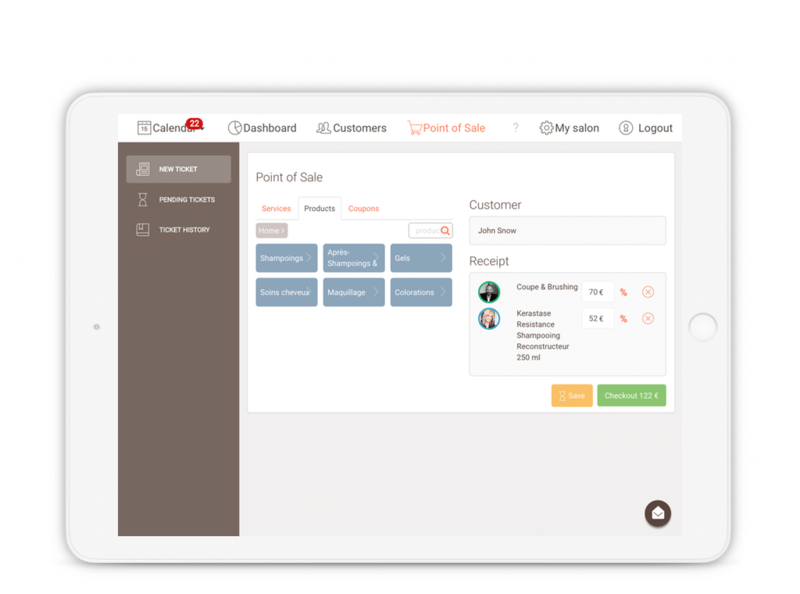 The perfect integration of the Salonkee POS with the smart agenda guarantees a smooth and continuous workflow – no need to switch between views – you can simply checkout the current customer right from your smart calendar. As easy as that. Speed up your workflow by using a POS that is clear and which looks nice. Find what you’re looking for and proceed to checkout in a few clicks. You tell the POS how to work – not the other way around. You have multiple possibilities to tailor the functions & checkout process to your very specific needs. One smart solution – endless possibilities. Our POS is not an Add-on to the smart agenda but a fully integrated solution. Salonkee reshapes the definition of ‘all-in-one’. 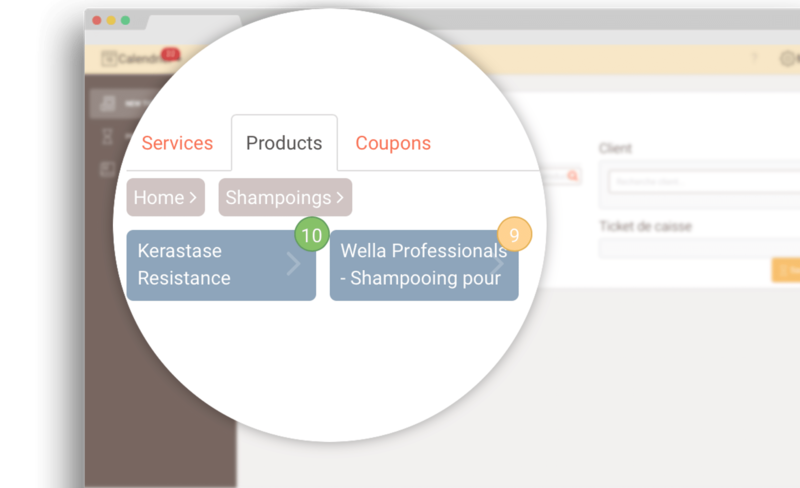 Salonkee automatically tracks your complete stock and presents it in a beautiful way: Never run out of this shampoo or that colour again. A wonderful gift to give – and you are the one being able to sell it to them. Gift vouchers are a perfect way of further fostering your customer relationship. Salonkee POS supports a wide range of scanners & printers and we will, of course, support you in your hardware setup from start to end. Manually tracking your stock can be quite cumbersome and highly ineffective. We set out to create an easy to use stock management system that helps you stay on top of your inventory. Add an unlimited amount of products and easily find them back with our barcode scanner. 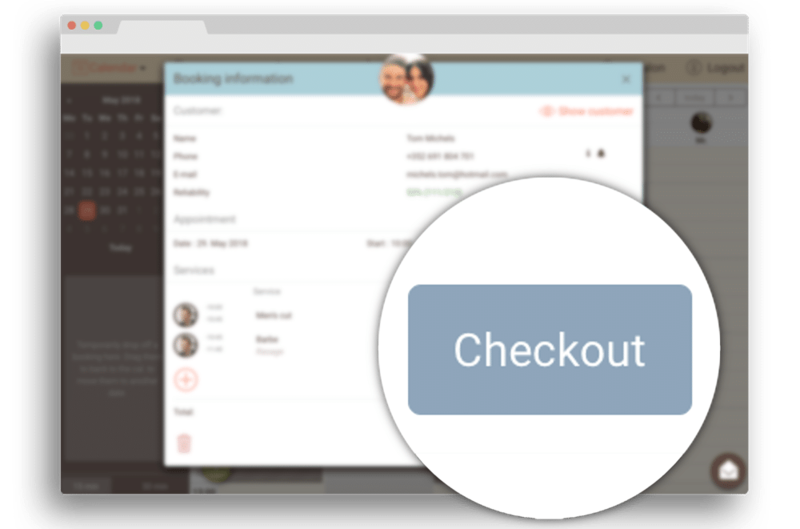 Add products to the customers receipt in a couple clicks and let our system take care of the rest. All without every leaving the calendar. Finally, keep track of your most popular products and detailed stock levels in our dashboard and report section. Never run out of stock again – Our system automatically shows you the number of remaining products in your stock during each checkout process. Each product sold decrease you stock, each new order fills it up again – easy right? With the Salonkee POS, you can easily print receipts for your customers. Planning to use Salonkee on a tablet? No worries, you can even print your receipts wirelessly. It doesn’t get more convenient than this! Every salon needs a place to safely store his cash during the day. With the connected cash drawer, you can be sure, that drawer does only open if necessary and cannot be accessed by an unauthorised person. Stock management can be quite a hassle if you are not using the right system with the right tools. Luckily, our stock management system can be easily connected to a barcode scanner, helping you find and enter the right products in less than a second. your daily beauty business in the simplest way possible.